We’ve all been there: You're watching the latest season of Orange is the New Black on Netflix when, all of a sudden, the video jerks to a stop—and the endless buffering begins. It's frustrating when your network slows down (or shuts down completely), but there are a few tricks you can use boost your Wi-Fi signal. Here are a few of them. 1. DON'T HIDE YOUR ROUTER. Most people hide their routers because they’re unsightly or in the way, but placing a router in a closet or in a cabinet is a one-way ticket to slow Wi-Fi: Walls and doors can degrade and absorb signal strength. Find a central location in your home and put your router on a table or bookshelf. Because some routers are designed to project a Wi-Fi signal slightly downward, keeping it higher off the ground will evenly distribute a Wi-Fi signal throughout your home. 2. STAY AWAY FROM APPLIANCES AND METAL OBJECTS. Microwaves, cordless telephones, flourescent lights, and even other routers in your neighbor’s home or apartment may interfere with your Wi-Fi signal. To reduce interference, place your router away from household appliances and set it to a different wireless channel and frequency. Using online tools—Acrylic Wi-Fi for Windows and AirGrab Wi-Fi Radar for Mac, for example—can help you find the right wireless channel with the least amount of interference. If you want an easier fix, most routers have an automatic option to find the best channel for your location. You should also avoid placing your router near metal objects, which can absorb signal strength. It sounds simple enough, but a majority of tech support problems can be cleared up by simply resetting or rebooting your router or modem on a regular basis. (It's also probably the first thing your Internet provider will ask you to do when you call to complain, so head them off at the pass.) And if you buy an outlet timer, you don't even have to worry about it: Set the timer to reset your router once a day at an off-peak time. 4. ... AND UPDATE YOUR FIRMWARE. Yes, we know—running firmware updates is annoying and time consuming. But if you have an older router, those updates ensure your router's software is running at its best and most efficient. And remember: It's best to buy a new router every seven or eight years. 5. ADJUST YOUR ROUTER'S ANTENNAS. Most routers have two adjustable antennas on top. If yours are parallel, it's time to switch things up and go perpendicular. Wi-Fi works best when signals are parallel to a device’s internal antenna, which are horizontal in laptops and vertical in desktop computers. Internal antennas vary in mobile devices, depending on how you’re holding them (in portrait or landscape mode). 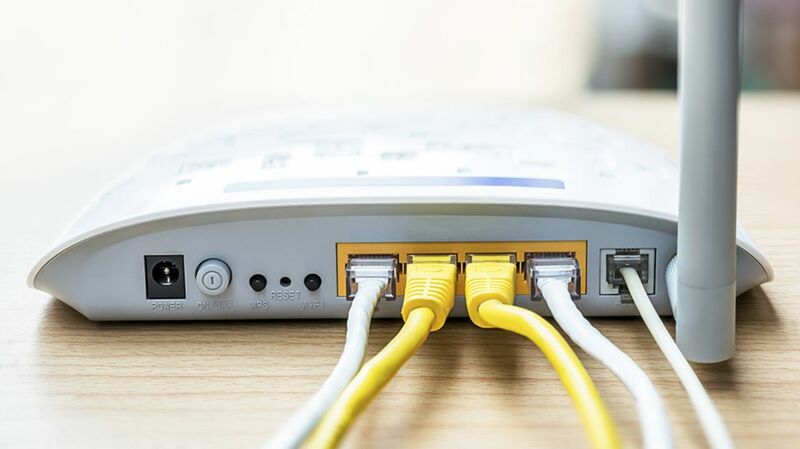 Keeping a router’s antennas perpendicular to each other will ensure a solid connection between your home network and your smartphones and laptops. Typically, a beer is something best enjoyed after a home improvement project is complete, but in this case, it's necessary to drink one before you even get started: The aluminum in beer and soda cans reflects and extend the signal farther than the router itself. Here's how it works. Step one: Have a beer and wash out the can. Then, remove the pop top and, using a pair of scissors or a utility knife, cut around the bottom of the can to remove it. Repeat the process for the top of the can, just below the mouth, but don’t cut all the way around—leave about 1 to 2 inches of space at the top to make sure the mouth of the can is still attached. Then, from the bottom, cut down the middle of the can on the opposite side of the space. Fan out the flaps to create a curve or parabola and turn the can upside down to stand it up. Stick one of the router's antennas through the mouth of the beer can and use a small piece of duct tape or blu-tack to keep it in place, then repeat the process for the other antenna. Although your router might look messy, your signal strength should greatly improve (at least in certain directions). If you don’t want to use a beer can, you can use simple household tinfoil to create the same effect. Because home Wi-Fi speeds are (slightly) dependent on how many people are using it at one time, a strong password is key: It will ensure that only authorized people are using your network. Take advantage of the security already built into your router and select a password (or better yet, a passphrase) that is a hard-to-figure-out combination of letters, numbers, and symbols. 8. ... AND STAGGER HEAVY BANDWIDTH USEAGE. If too many people on your home network are using heavy bandwidth at the same time, like playing online video games, watching Netflix, and downloading movies and music from iTunes, then your entire network will slow down for everyone. Try to stagger heavy Internet use to make sure your home network is running fast and smooth for all users. Most routers have a range of about 150 feet. If you live in a big house, devices and computers in rooms farthest away from your router might have a hard time connecting to your home Wi-Fi network. The easiest fix to boost the signal in those rooms is to buy a Wi-Fi repeater, which can plug into any wall outlet and will increases a signal's range and strength to the farthest parts of your home (with a corresponding decrease in internet speed for those connecting to the extender, but you can’t have everything). If you’re feeling more ambitious (or cheap), you can turn an old router into a Wi-Fi repeater with a little bit of programming and hacking.